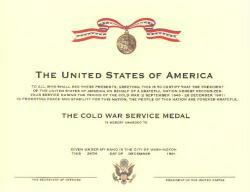 Cold War Service medal certificate. This measures 8 1/2 by 11 inches. Has the medal with ribbon in the center and the US seal at the bottom center.